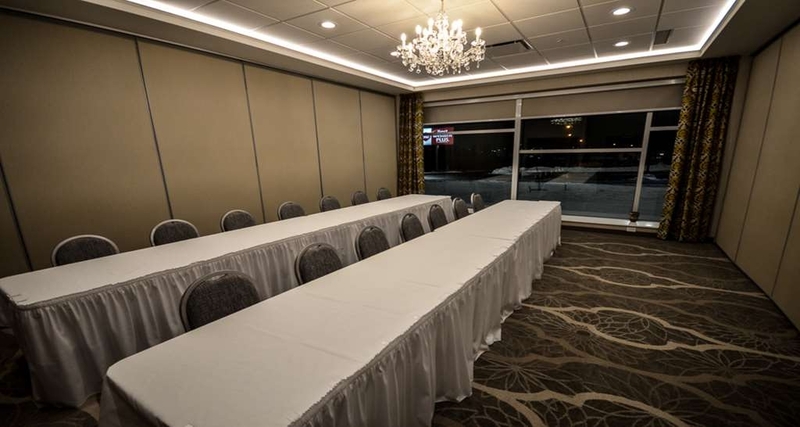 Das Best Western Plus St. John's Airport Hotel and Suites ist ideal in St. Johns Stadtzentrum zu finden. Erleben Sie ein schöner Aufenthalt in der Nähe von alle Sehenswurdigkeiten. Bestpreisgarantie und exklusive Angebote. 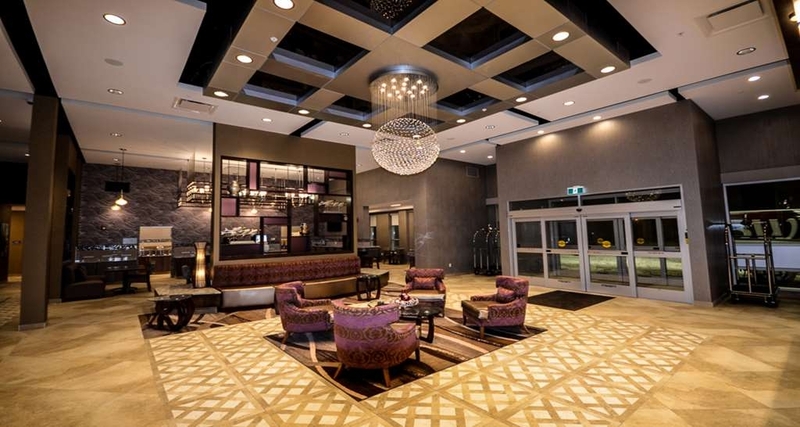 Das schöne, neue Best Western Plus St. John's Airport Hotel and Suites mit modernster Ausstattung ist ideal gelegen, direkt am St. John's International Airport. Es ist nur wenige Minuten von Stadtzentrum, Signal Hill, George Street, wichtigen Touristenattraktionen und Memorial University entfernt. Das Hotel befindet sich auch in günstiger Lage in der Nähe großer Einkaufszentren und einiger der besten Restaurants Kanadas. 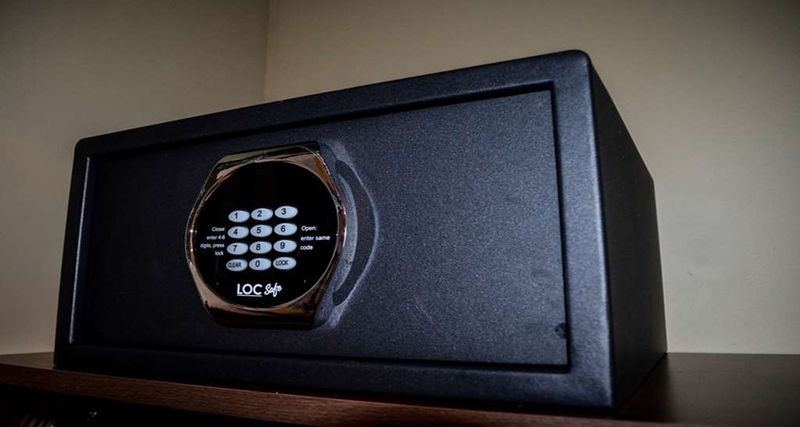 Dieses neue Hotel bietet 175 gut ausgestattete Zimmer und Suiten, 130 Quadratmeter große Tagungsräumlichkeiten, ein kostenloses komplettes warmes Frühstücksbuffet, ein beheiztes Hallenbad und einen Wannen-Whirlpool sowie eine beeindruckende 36 m lange Wasserrutsche. Genießen Sie Ihr Lieblingsgetränk und Speisen in unserer spektakulären Lounge oder auf unserer schönen Terrasse, beide mit einem gemütlichen Kamin. Sehen Sie vom Komfort Ihres schallisolierten Zimmers aus den Flugzeugen und Hubschraubern beim Starten und Landen zu. In diesem bemerkenswerten nagelneuen Hotel mangelt es an nichts. Wir freuen uns, Sie für einen Besuch der schönen Stadt St. John's bei uns willkommen zu heißen. Beautiful hotel, great experience! Kids thoroughly enjoyed the slide and pool. Hot tub is really nice. The decor in the lobby and through out the hotel is absolutely gorgeous. Beds are comfy, rooms and bathroom was very clean, overall excellent !! Dear stephaniedldawe, We always enjoy reading our guest reviews, especially when they're as good as this one. Thank you. We take pride in our St. John's hospitality and we're happy the kids enjoyed our service and on-site amenities. We'll be sure to share your comments with our hotel team. Looking forward to welcoming you back again soon. Travel Safe! Gorgeous new hotel, fantastic pool, spa and waterslide, food ( delicious seafood chowder) was excellent and staff lived up to the reputation Newfoundlanders have of being the friendliest, most helpful and kind people in Canada (if not North America)! Top notch! Dear franzskunk, Thanks so much for the review. We're glad you feel our staff treats you like family, because you are! We appreciate that you continue to choose us when you come to St. John's, and we look forward to seeing you next time. From your Newfoundland Best Western family! The hotel was beautiful. Rooms are lovely and clean. Staff was amazing. Food at the restaurant was great. They offer specials throughout the week. For anyone who has an early flight this hotel offers breakfast to go. It was lovely, had a juice, fruit, yogurt and a granola bar. Dear shyoung113, Thank you so much for taking the time to write such a great review about us for all future travelers to read. We are so excited you enjoyed your breakfast to go witch is the most important meal of the day! Come see us again soon. 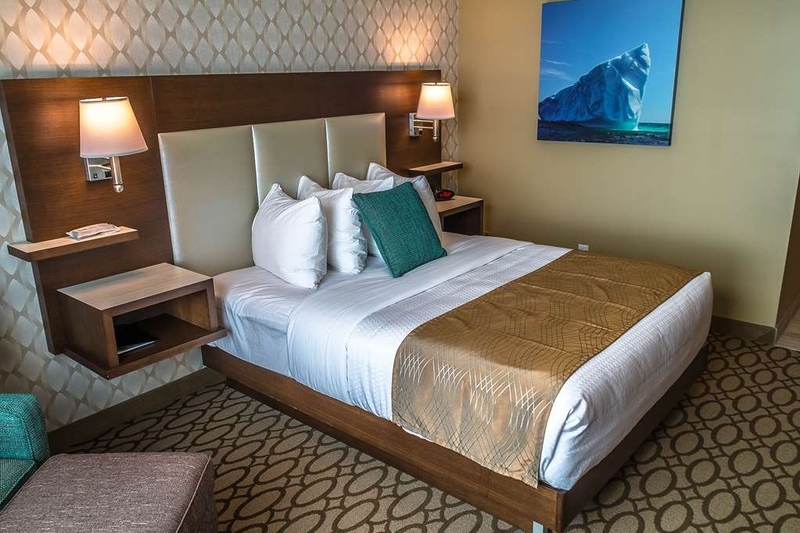 "Absolutely best hotel in St. John's"
Dear newfi019, We always enjoy reading our guest reviews, especially when they're as good as this one. Thank you. 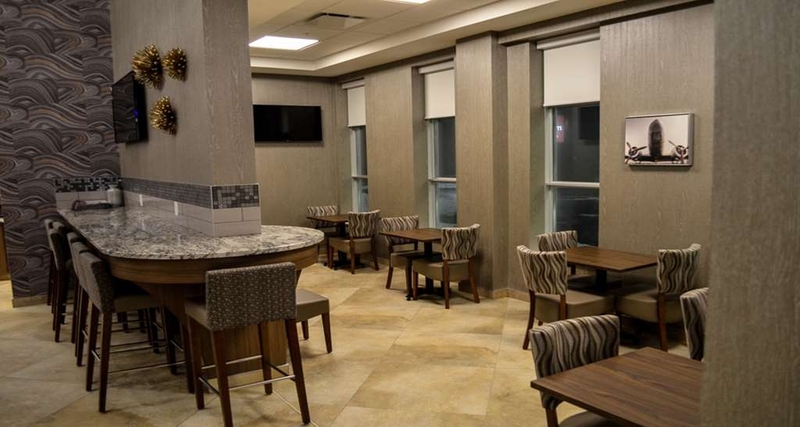 We take pride in our St. John's hospitality and we're happy you enjoy our service and on-site amenities. We'll be sure to share your comments with our hotel team. Looking forward to welcoming you back again soon. Travel Safe and wow, thank again! Great location right near airport with shuttle service.I would recommend this place to anybody who has to be at the airport.at an early hour.The staff are very friendly and professional, even though we didn't have time to enjoy the hot breakfast we were given a lunch to go. Dear chiscock100, Thank You so much for your comments. We value your business, and hope you return soon. Safe Travels. I needed to stay here because of a cancelled flight from Air Canada. It is an airport hotel so not very near the hubbub of the city but it is a really lovely place to spend a night. It has really pleasant decor, comfortable beds and my room had a bit of a suite feel with a sofa to watch TV on. For a layover it was very comfortable. The restaurant is well designed and the food is good. It is not Fine Cuisine but good food with local twists. Nice and clean close to Airport with good friendly service i would recommend anytime. Good confortable beds nice big clean rooms restaurant food was good if you got it in time before it got cold and the menu could be revised but the food was good. Got stranded in St. Johns by the airline, was in a foul mood. But the staff here were warm caring and friendly. We were able to get a bite to eat at midnight. Rooms were clean comfortable. Love this hotel. Will definitely return. "Hotel & staff were great; food is mediocre"
Good location if you need to be near airport; hotel is beautiful; food not so good. Bus is not too far away but only comes about once an hour. Staff doesn't seem to know much about the bus. Not sure how much a taxi to town would cost. About $20 American? 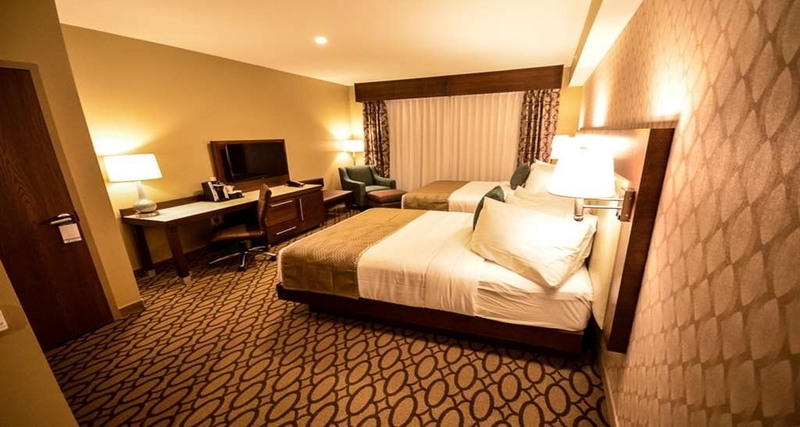 "Nicest Best Western I have stayed at!" This is an awesome Best Western Plus Hotel. 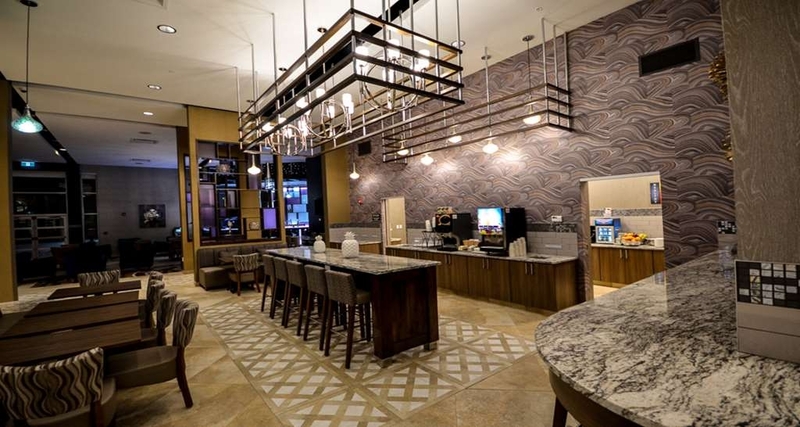 It has all the amenities that other BW Plus hotels have, but has a huge, wonderfully decorated lobby with a restaurant/lounge right off the lobby. You still get free breakfast. Appears to be very new and was very clean. Friendly, helpful staff. Would stay here again. 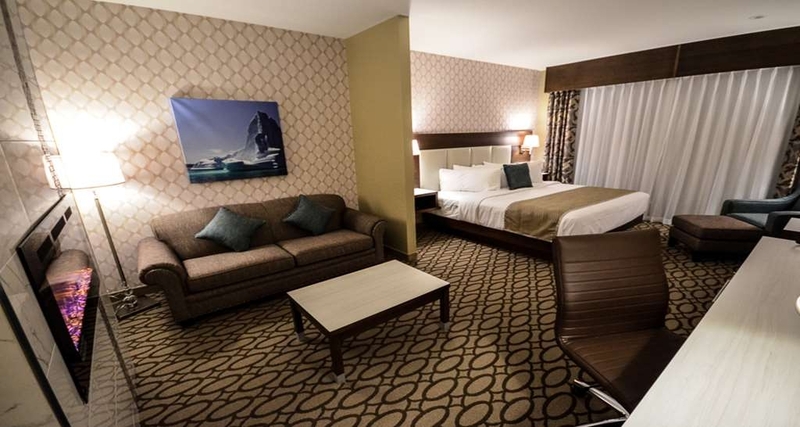 We recently had occasion to stay at Best Western at the St. John's Airport. I had booked this hotel because we planned to stay one night, fly out to Saint Pierre & Miquelon for 3 days and then return to Best Western St. john's For an additional night. Of several hotels I had called, inquiring if they would be willing to store our bags for those 3 days we would be away, Best Western Airport Hotel was the only one out of several I had called that was willing to accommodate our request. In addition to the excellent service, I must say the staff were the most dedicated and friendly that we've ever encountered, going above and beyond expectations in order to make sure our stay was exceptional. This was a great hotel, very friendly staff nice new hotel, highly recommended great facilities rooms are great, nice and clean very comfortable beds, The morning complimentary breakfast was good, the complimentary drinks of coffee and juices is nice as well, Thank you for the great experience. Dear Canadiantraveler81, Thank you for taking the time to comment. I am happy to hear you enjoyed your stay with us! We strive to make your stay as enjoyable as possible and am glad we did. We look forward to having you stay with us again real soon. Travel Safe! "Beautiful and Convenient Airport Hotel"
We had an excellent one night, pre-flight stay at this beautiful new hotel. Everything was stylish and impeccably clean. Service was exceptionally friendly and genuine,and everyone from the front desk staff to the shuttle driver and breakfast attendant were all very helpful and seemed to be genuinely enjoying their jobs. Nice lounge and pool/hot tub areas. Spacious, comfortable and and nicely decorated rooms, there was a nice fireplace and sofa in our room as well as a very nice washroom with oversized rainfall shower. Complimentary hot breakfast or grab'n'go breakfast bags. Convenient and complimentary 2 minute shuttle ride to the airport. Happy to recommend this shiny new hotel whose owners have clearly put some thought into the "extra" touches that make a hotel stay stand out from the pack, and we will certainly be staying there again. "You gotta try this place." We were guests here for 7 consecutive nights. Absolutely the best! At the desk, William and Ashley were pleasant, eager to help, capable: made us feel welcome. Krista, Rim were great, too. Rita in room service was warm and helpful. Breakfast: WOW! Deborah kept the delicious food bins full and kept the place clean and inviting. Best 'included' hotel breakfast we have ever had. The hotel is less that a year old and is in excellent repair, but the cleaning staff go over and above to keep it clean and tidy in the rooms and in all the common areas. The air conditioning and heating in the room actually work as they should and allowed us to stay comfortable at all times. The location near the airport is handy but not at all noisy. The road system from the hotel made downtown and the county roads very accessible. When in St. John's, this is THE place to stay. Great hotel near the airport. Located just off the main road so makes for getting anywhere in the city a breeze. There is a free The staff are very friendly and always welcoming and always saying hello when they see you. The breakfast was fine for what I needed. Some people complain about the set up of these breakfast stations. If you want a restaurant style breakfast you need to go to a restaurant. The hotel is next to the airport but because of the triple pane glass you do not hear the planes at all. Rooms are large with comfortable beds and nice size bathroom with sliding glass doors that keep the water in and not out onto the floors. There is also a restaurant that serves food in the afternoon and evening. So if you are staying here because you have an early flight in the morning, you can get a meal here. They should have menus in the room for the restaurant so you have an idea of what they offer but they did not. Hopefully they will add one soon. Overall a great place and will be staying here again. Dear KenCPink, Thanks for staying at the Best Western Plus St. John's, and for your sharing your comments with the traveling community. 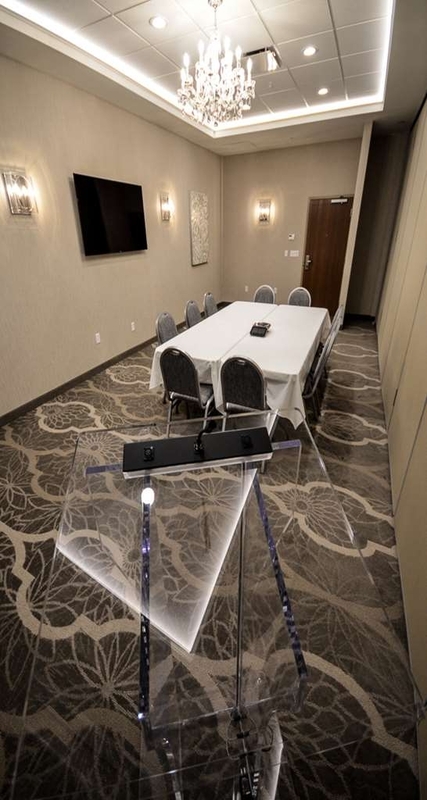 We strive to provide the best experiences for our guests and we're pleased to hear that you had an enjoyable stay in St. John's We are in the process of printing the menus for all our guest directories in all our rooms. We hope we have the pleasure of seeing you again soon. Travel Safe! What a great hotel! So much to say..... - great new hotel; walked into main lobby after a long road trip and were pleasantly surprised (beautiful chandelier and reception area, great lounge, and breakfast area, and front desk staff were extremely professional and friendly - William and Zaid were exceptional front desk staff (friendly and extremely helpful) - room was fantastic - very well kept with special touches everyday, linens were always clean; room was generous enough for a family of four - breakfast is good enough to start your day ; I am sure it was a hotel executive who took my knife with peanut butter all over it to the kitchen after the staff had closed the breakfast dining area at 10 am! That was great....breakfast staff were friendly and helpful. - Stephen was also fantastic with maintenance to our room; and he also stopped me in the hallway the next day to ask if everything was fine - the owner introduced herself to me and even chatted with my teenagers! 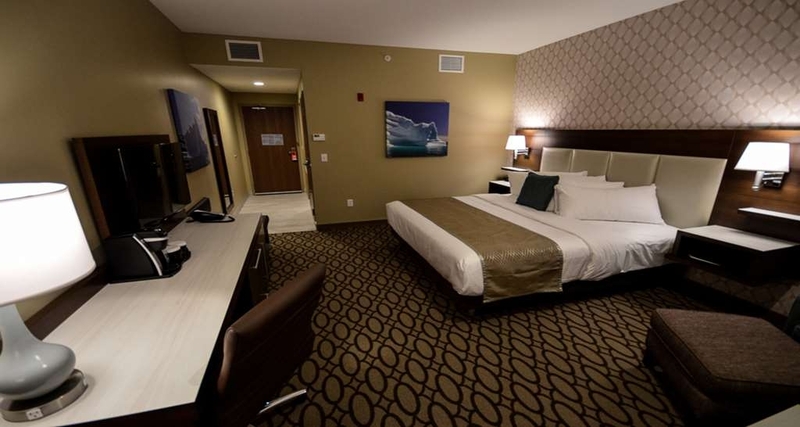 - the hotel is right next to the airport but you wouldn't know it because there is no airport noise and close to a Tim Horton's and Orange Convenience Store. - Overall a great stay and highly recommended .....a Toronto Family! Thanks so much for the review. We're glad you feel our staff treats you like family, because you are! I'll be sure to pass your compliments along to our great staff. I know they'll be as grateful for your kind words as I am! 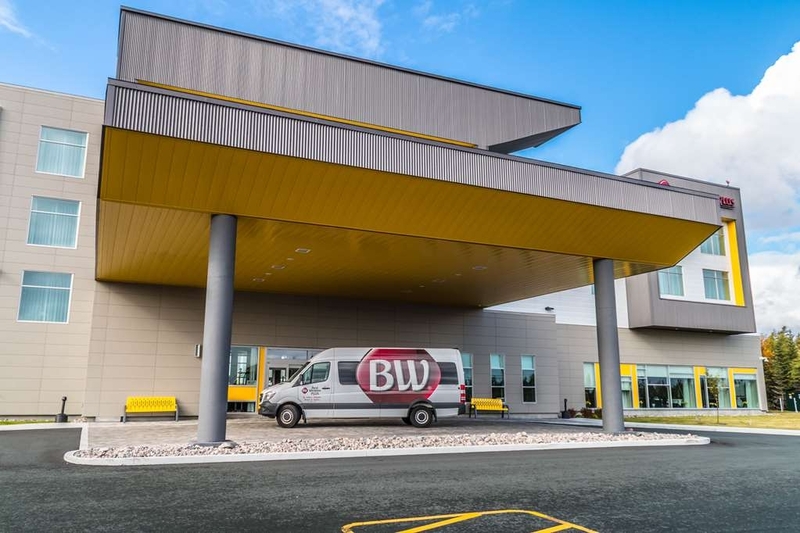 We appreciate that you continue to choose us when you come to St. John's NL, and we look forward to seeing you next time.Safe travels back to Toronto from all your second family at the Best Western Plus! "Everything it should be + waterslide"
If all they had was a hot tub and a waterslide my kids would still be the happiest campers around (3&5 yo). For me, the proximity to the airport and the overall quality of the place was exactly as it should be. 5 stars for an airport hotel. Pros - New hotel and everything even smells new - Pool, hot tub and 120 meter waterslide were the reason I picked the hotel (plus the great reviews) and none disappointed. My kids wanted a waterslide hotel or nothing for the rest of the trip! -1 minute drive (or less) once I picked up my rental car at the airport - There is an airport shuttle (though one could walk if needed) - Good breakfast selection (hot and cold) - although all at the expected standard (ie. powdered eggs, etc - but the waffle machines were great). 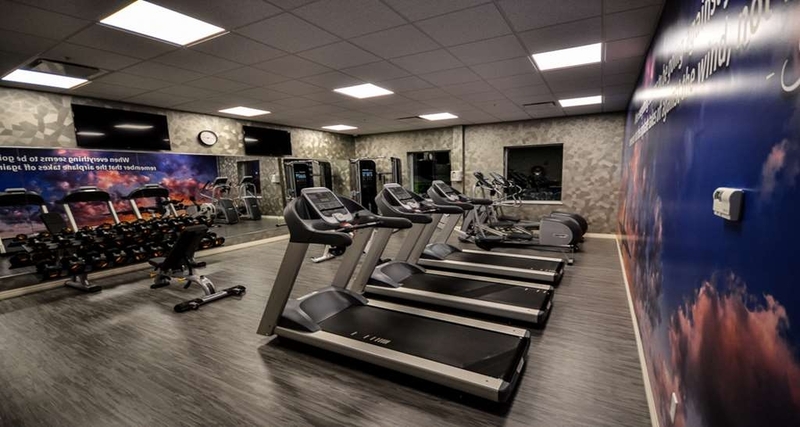 - fitness area - Room was as expected - clean, all basic amenities, nice shower, TV channels good, large washroom, microwave, mini-fridge, tea available, etc. - Temperature controls worked -No problems with noise - Little area in the lobby to buy snacks (and small selection of frozen goods that could be eaten with in-room microwave) - Lobby eating area is nice (there is a patio too) and the kids loved the fake flames (water vapour over orange pot lights) -Check-in dude with the radio voice (William) was great Cons -A little bit of a hike to the room, but not a big deal -Food in the restaurant was a bit basic and service was a mite slow - apparently the hotel is generating a little local buzz and they have started getting walk-ins recently so will need to hire more staff (good for the economy I suppose) Would we go back - 100% yes if we back in the area. I might even base ourselves from there if we planned to spend a couple of days in the area as downtown St. John's is not exactly charming while Cape Spear, Signal HIll, etc, were amazing (we had blue skies and 20C so were spoiled) but most people drive to these places anyway. Dear Jon_R_Travel, Wow! Thanks for staying at the our brand new facility, and for your sharing your comments with the traveling community. We strive to provide the best experiences for our guests and we're pleased to hear that you had an enjoyable stay in St. John's .We're happy you enjoy our service and on-site amenities. We hope we have the pleasure of seeing you again soon. Travel Safe! We decided to rent a room for my sons birthday and invite a few friends to come join us for the celebrations. We went swimming and they very much enjoyed the water slide. We did pizza and cake in the room and they also hooked up all their video games and computers up and had quite a fun night. The free wifi was great!! Breakfast was wonderful the kids and I really enjoyed it and thought that the waffle station was so yummy and cool!!! The staff was so helpful several times during our stay.The hotel was extremely clean and modern, at the same time it embraced the Newfoundland essence I paintings and other cool ways like the iceberg beer bottle chandelier in the restaurant.My sons birthday was a success and the kids and their moms were very impressed!!! Most of all so was I :) I've stayed at most hotels in the city and this one by far is the best. Dear beca_5, Thank you for taking the time to comment. I am happy to hear you and the boys enjoyed your stay with us! We strive to make your stay as enjoyable as possible and am glad we did. We look forward to having you stay with us again real soon. Happy birthday again to your son from all your BW family! These ladies and wait staff (Chelsey and Sheryl) are phenominal. I came to Newfoundland knowing nothing and they sent me in the completely right direction. I am so grayefultfor meeting them. I am not sure my trip would have been the same Witnout their knowledge. Dear ?????? ?, I'll be sure to pass your compliments along to our great staff. I know they'll be as grateful for your kind words as I am! We strive to provide the best experiences for our guests and we're pleased to hear that you had an enjoyable stay in St. John's. We hope we have the pleasure of seeing you again soon. Travel Safe! "Great new hotel. Great staff"
New property located very near airport. 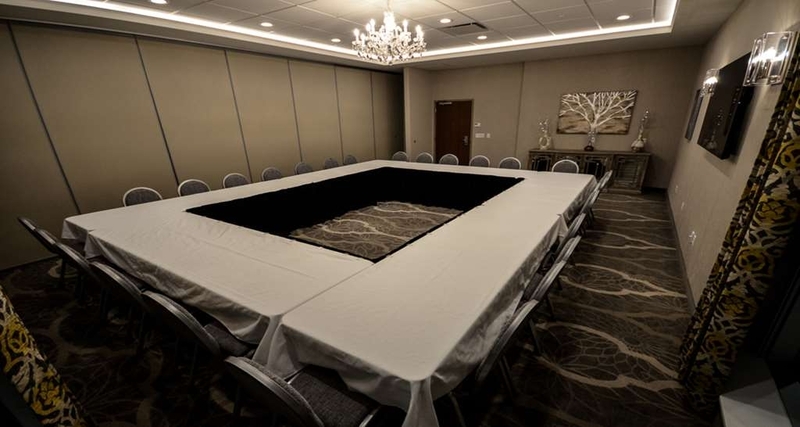 Not your average Best Western Plus, more like Premier property. VERY nice inside. 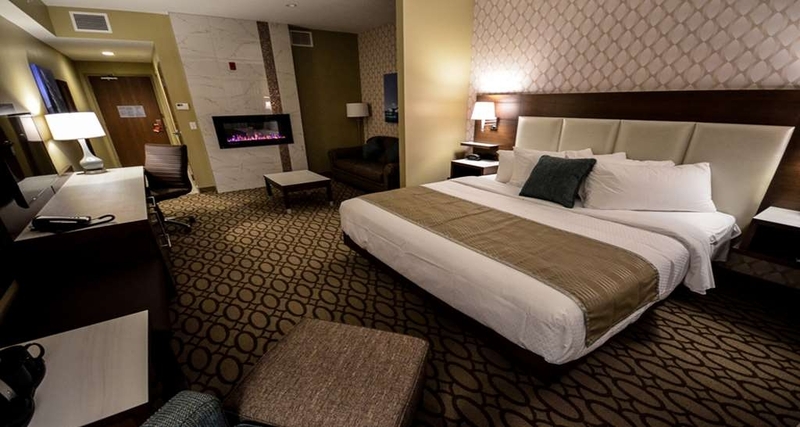 Some rooms even have electric fireplaces! Lots of staff going around keeping things VERY clean. Had a chat with Front Desk Manager Mason and kudos to him on his staff doing super efficient and FRIENDLY check in check out. Pool and hot tub are great. Breakfast quite good. At most properties the food has dwindled if you arrive in the last half hour of service but not here. Still putting fresh hot bacon out at 15 minutes before close. Breakfast staff just super nice and complimentary of my chef-ing up the waffles! Also, nice to recognized and upgraded as a Diamond member. Dear RodnLucky, Wow! We always enjoy reading our guest reviews, especially when they're as good as this one. Thank you. 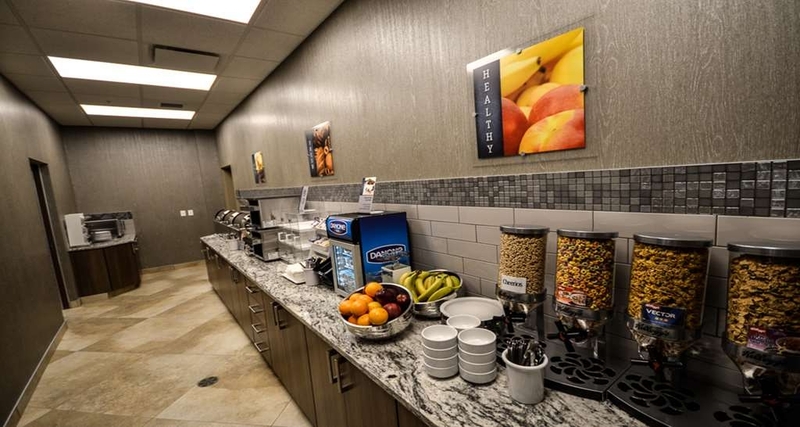 We take pride in our St. John's hospitality and we're happy you enjoy our service on-site amenities and our delicious breakfast. We'll be sure to share your comments with our hotel team. Looking forward to welcoming you back again soon. Travel Safe! This is a beautifully appointed hotel that has courteous staff, free breakfast AND dinners. I have nothing but good things to say about this property, save for one. 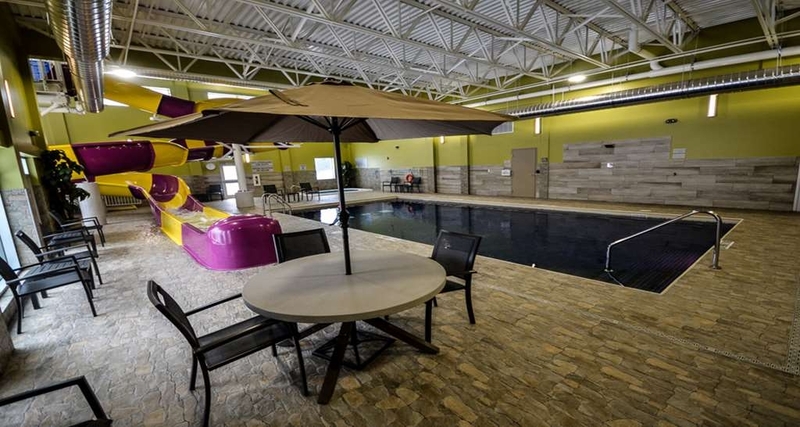 I booked this hotel because it had a pool and with two kids, a pool is an important feature when staying in hotels. We stayed here for three nights and upon our arrival were told the pool was closed due to maintenance. It was obviously a huge disappointment, but we still had a great time in St John's. I think it would be nice if the hotel in the future provided updates such as this for potential customers and let the booking sites know as well, so that they can post it. For the record, we checked and no work was done on the pool area during our stay. Dear Scott M, Thank you for taking the time to comment. I am happy to hear you enjoyed your stay with us! We strive to make your stay as enjoyable as possible and we're sorry that the pool and hot tub was getting cleaned during your stay. We look forward to having you stay with us again real soon. Travel Safe! 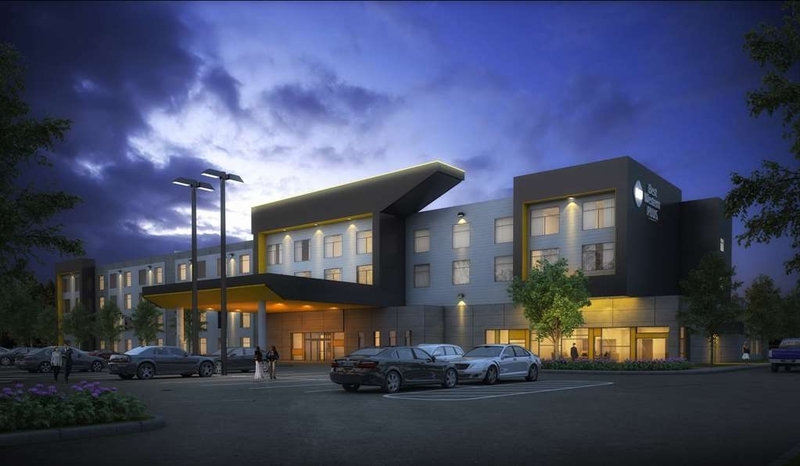 "New hotel that didn't feel like it was in Newfoundland"
This is a hotel I would use if I was running a conference and I wanted everyone to fly in and meet near the airport. It felt new. It was slick. It had a fabulous pool and hottub. There was a very nice breakfast and the rooms were beautiful. The lobby is beautifully appointed and it has a little shop to buy food, snacks and ice cream. We had a wonderful stay here while we waited for our plane. People were very nice at the front desk and there was a walk in shower without a tub which I really enjoy. The shampoo products and soap they had were also above normal quality. Everything about this hotel said class but not the charm that I had been accustomed to in other hotels in Newfoundland. There was no noise from the airport or from neighboring rooms.
" Air Canada you choosed a great hotel ! ! " WOW ..... Super super professional, kind and thoughtful service from check-in, breakfast cooks and shuttle bus driver. The new deck is amazing. Best hot tub in town . Delicious breakfast. Beds , linens and whole room so clean. Dear Patsy-Gord O, Thank you for taking the time to comment. I am happy to hear you enjoyed your stay with us! We strive to make your stay as enjoyable as possible and am glad we did. We look forward to having you stay with us again real soon. Travel Safe! This was a night away with my husband, something we don't do very often with two children. We booked a whirpool room and it was worth it. Were treated like royalty from check in to check out by all staff. Amazing rooms, amazing amenities. We enjoyed the onsite bar with food. The bar staff were super friendly and were aiming to please. Thanks for the great night away for relaxation. justaNLgirl, Thank you for taking the time to comment. I appreciate your comments and we're glad you enjoyed your lovely room. It was nice to hear you were able to come back to the room and relax, take in a few of our amenities and enjoyed your stay. Thank you for choosing to stay with us and come visit us again. Was travelling for work, needed a location that would have breakfast, fitness center, and a shuttle to the airport as well this was a new hotel so I was curious. Very pleased with the friendly staff, the cleanliness, the amenities and convenience of the hotel. Super comfortable and had no issues with anything. Dear shannonleereid, Thank You so much for your comments and to having choosing us as your hotel. We value your business, and hope you return soon. Safe Travels. "Flight cancelled & air Canada booked us here"
We were flying home from Toronto, ON. Our air Canada flight had been delayed then cancelled due to mechanical problems. We weren't gonna have anywhere to stay until we spoke with air Canada then they booked us in this nice hotel. Really good service and nice workers. Has a workout room, pool,and hot tub, oh and a shuttle ride to the airport. Dear Chri A, Thanks for staying at the Best Western Plus St. John's and for your sharing your comments with the traveling community. We strive to provide the best experiences for our guests and we're pleased to hear that you had an enjoyable stay and enjoyed our amenities. We look forward to seeing you next time! Dear Davis M, Thank you for taking the time to comment. I am happy to hear you enjoyed your stay with us! We strive to make your stay as enjoyable as possible and am glad we did. We look forward to having you stay with us again real soon. Ps: We sell mattresses, if you're interested please call us directly at 709 758-5004 Safe travels! We stayed at this hotel while returning from vacation. The place is new and very welcoming. The staff were all very helpful and accommodating from checkin to turning on the water slide for us. Would recommend this hotel to anyone. Dear Brad1981, Thanks for staying at the Best Western Plus St. John's, and for your sharing your comments with the traveling community. We strive to provide the best experiences for our guests and we're pleased to hear that you had an enjoyable stay in St. John's. We hope we have the pleasure of seeing you again soon. Love this hotel!! The rooms are neat and clean, the hotel itself is very elegant and spacious. The pool with slide and hot tub was ideal as I have a child. There is a great selection of breakfast items and having coffee available at all times is wonderful!! Its so nice to walk in and be able to get lemon/orange infused water at your fingertips. I have stayed now 3 nights in the past few months and will definitely be returning again!!! Our stay was simply fantastic. The staff are amazing and the comfort and cleanliness of the hotel was more than I could have asked for. Breakfast was delicious and very filling! Loved the pool and water slide. The overall stay at this hotel was fantastic. The very friendly and professional staff really made us feel welcome. Our room was very clean, spacious, and the beds were extremely comfortable. We are already booked to stay here on our next trip to the city! "Awesome place, service, amenities, and breakfast"
Came for a short two night work trip and everything was great. Free breakfast was awesome, better than if you went down the street to a diner. Air port shuttle is almost like a personal valet service, they'll come to you. Restaurant and bar inside are good but not too cheap. Everyone greats you with a smile and are willing to help. Stay here, you'll be pleased. We spent a night here recently and was very pleased to find a full service hotel, even if the restaurant has a limited menu. Nice to be able to after a day of travel, shopping or site seeing. The hotel is new and nicely decorated. My Grandson enjoyed the pool and water slide. The service was friendly and professional and this will be our hotel of choice on our next visit to St. John's. People working at the front desk went above the call of duty to ensure we were satisfied. Amazing service. The bed is extremely comfortable. The room was really clean and housekeeping did a great job. My only complaint was the pub food we could order it was not a very good selection and was not very tasty. Free breakfast with a good selection makes up for that though. Will stay here again. we had a very comfortable stay and enjoyed the pool and the water slide with our daughter , son-in-law and grand kids. The playpen for the baby was very helpful. 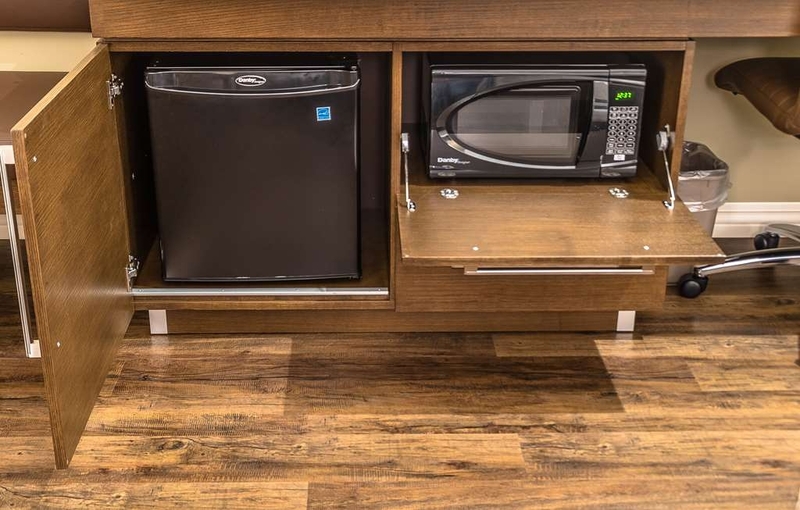 We always find what we need with the Best Western. Dear thaving, I'll be sure to pass your compliments along to our great staff. I know they'll be as grateful for your kind words as I am! Thank You and hope you return soon. Staff could not have been any kinder. I had been staying at another hotel in downtown, and they were having issues so I decided to look into other hotels. I found this hotel online, brand new place, close to highway, and staff was absolutely fabulous. Dear fins209, Thank you for the nice comments about our new facility. We also appreciate the nice comments about our associates being helpful and friendly. Many thanks and safe travels. "Best Hotel in St. John's"
This hotel is absolutely amazing. I have never stayed in such a clean and beautiful hotel. The staff were incredible. Once they found out it was our honeymoon (prior to check-in) they surprised us with treats on our bed, a congratulatory card and a bottle of champagne delivered to our room. Our room was incredible and the bed is SO SO comfy. We had a guest stay over one night and we were even extremely impressed by the pull out couch. The free breakfast, free 24 hour coffee, the beautiful decor, exceptional staff, comfort and cleanliness truly put the hotel above all the rest. I have stayed at many hotels in the area and this far surpassed all others. Special shout out to staff member Krista whose thoughtfulness made our honeymoon so much better than we expected. Dear JJkins, Thank you for taking the time to comment. I really appreciate sharing your amazing experience at the brand new Best Western Plus and we're glad we made your honeymoon unforgettable. 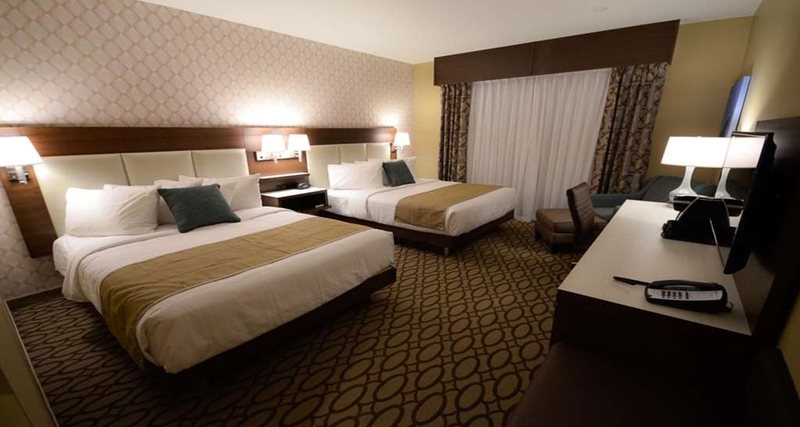 It was nice to hear you were able to enjoy your room and relax, take in a few of our amenities and enjoyed your stay. Thank you for choosing to stay with us and hope will see you again shortly! Our flight was late, our luggage was lost and it is was pouring rain. I called the Best Western and spoke with Matthew on the Front Desk. We didn't have a reservation and not only did he accommodate us but he upgraded us as well and gave us a late checkout so we can get some rest. Getting there at 4:30 am after travelling for almost 24 hours and getting this treatment was fabulous and so much appreciated. The place is amazing, the staff are superb and the location is ideal. Thank you for taking such good care of your guest and our vehicle while we were away! Dear MDake, Thanks so much for the review. We're glad you feel our staff treats you like family, because you are! We appreciate that you continue to choose us when you come to St. John's, and we look forward to seeing you next time. "Brand new, delivers on stellar service and comfort"
This was one of the best hotel experiences I've ever had! Staff went above and beyond to welcome, orient and assist us. They took our bags to our room, showed us where the pool was and where breakfast was to be provided the next morning. The lobby is beautiful modern and the rooms are spacious and very comfortable. Dear Halle C Thanks so much for the review. We're glad you feel our staff treats you like family, because you are! We appreciate that you continue to choose us when you come to St. John's, and we look forward to seeing you next time. 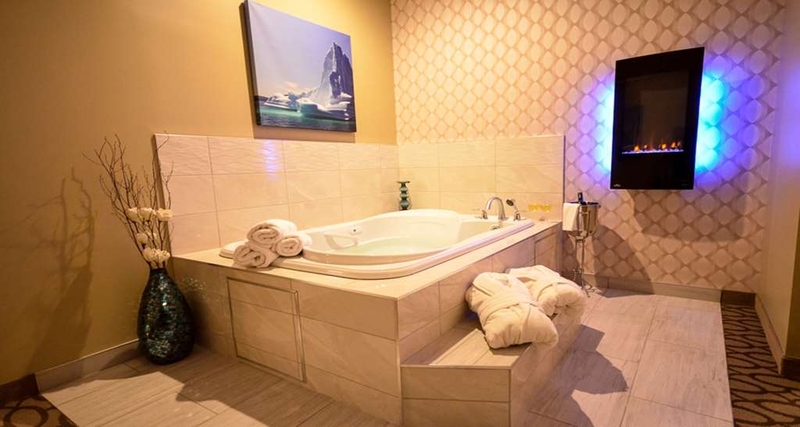 After staying in a few boutique hotels downtown for other occasions, myself and my wife decided to spend our honeymoon at Best Western Plus St. John's. We were the first newlyweds to spend their honeymoon here ! And the hotel absolutely took care of us. The staff are amazing and go out of their way to make your stay memorable ! We stayed in the king room with spa bath and we were greeted with a lovely bottle of champagne thanks to the unbelievable staff. The hotel itself is chic and high end with a great complimentary breakfast included. We will absolutely be back for our anniversary! Hands down the most friendly and helpful hotel staff. We stayed here 3 nights as a base to explore the St. John's area. It is only 10 mins from downtown so was easy. It is a new hotel, and the staff were all extremely friendly and helpful. The rooms are a decent size and the beds comfortable. The bathroom is lovely and the toiletries are wonderful - a facial bar of soap as well as regular soap is a great touch! The hotel breakfast is pretty decent too, with a waffle station that the kids loved! My only negative is the air con unit is extremely noisy when it kicks in. I would have thought with a new hotel they could have had a quieter system. Also a magnifed makeup mirror would be such a nice touch for makeup application ?? But I say this in most of my hotel reviews. We would definately stay here again. Dear Yorkielassincanada, Thanks for staying at the brand new Best Western Plus St. John's, and for your sharing your comments with the traveling community. We strive to provide the best experiences for our guests and we're pleased to hear that you had an enjoyable stay in St. John's and I will be sure to keep your suggestion in mind. We hope we have the pleasure of seeing you again soon. Travel Safe! Hotel is amazing. Breakfast was hot and plentiful. Staff were non-stop keeping food prepared and tending to everyone's needs. Rooms were big and comfy beds. Hotel is immaculate. Staff couldn't be nicer. Exercise facility and pool were awesome - 5??. All the Staff were so friendly ?? Thanks for a fabulous start to our vacation!! Dear Bill L, Thank you for taking the time to comment. 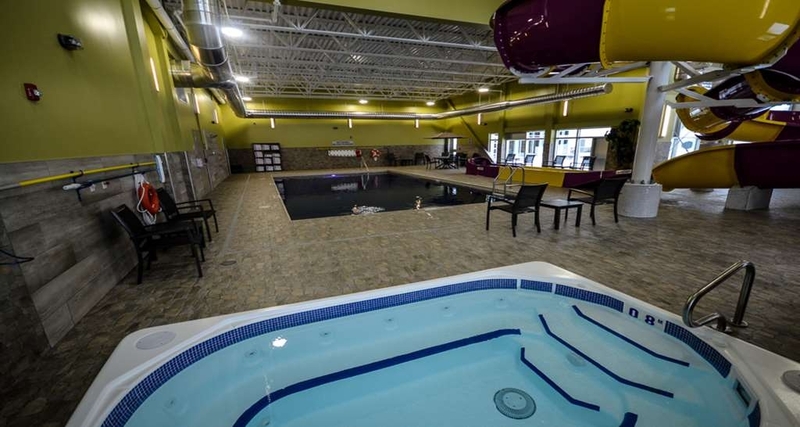 I am happy to hear you enjoyed your stay with us and had the chance to enjoyed our fitness center and our amazing pool! We strive to make your stay as enjoyable as possible and am glad we did. We look forward to having you stay with us again real soon. Travel Safe! Fantastic! The staff was friendly. The room was clean and quite with a beautiful view. The bathroom was clean and modern. No bath tub bit beautiful walk im shower. The hotel appeared new. The lounge was beautiful and looked romantic with a fireplace.in the center. We enjoyed a hot continental breakfast. The water slide and pool were Fantastic but were not monitored. This hotel is perfect for families, business or pleasure. Dear Amberley B, Thank you so much for taking the time to write such a great review about us for all future travelers to read. We are so excited you enjoyed your stay and enjoyed our delicious hot breakfast buffet. We strive to make you feel at home when you are with us and there is nothing better than blending your family with our Best Western family. See you again soon! We stayed were at this hotel for one night. The staff was very friendly. We really enjoyed talking to the 2 girls at the front desk. Our room was lovely although the fan for the air conditioner was very loud. Breakfast was fantastic And the coffee was great. The hotel is new and very clean. But..... I left my iPhone cord by mistake and realized it later in the day that we checked out. I called and asked if it had been turned in. It was not in the lost and found. I asked if someone could go and check the room we were in to see if the cord was still there. I was told that was NOT possible for security reasons. I was told that I would receive a call back they evening and told whether or not housekeeping had seen it. I did not receive a call. I was told I would be called first thing in the morning. I did NOT receive a call. Nobody has called me back yet and it is almost 24 hours later. I do not understand why someone could not go up to the room that we were in and retrieve my cord for me. I do not understand why I was not called back. I think this is very poor PR. It leaves a bad taste in the mouth for this very lovely hotel. Dear Christina M, Thank you so much for the review. I would like to apologize because, from the sounds of things, you were not as quite blown away as we hoped. I'm in the process to see what happened exactly so we can try to find your iPhone cord. Someone will call you today regarding this issue. We always strive for perfection and do not like to see our guests disappointed in any way. Come visit again! Our flight was diverted to St Johns after some mechanical issues in the middle of the night. The staff there accommodated our entire load of passengers with a smile, checked us in quickly, and continued to go above and beyond in their service and communication with a group of anxious and stressed out passengers. Their attitude of service was an exceptional representation for their community. Dear b0921kurz, Thanks for the nice review and for your sharing your comments with the traveling community. We strive to provide the best experiences for our guests and we're pleased to hear that you had an enjoyable stay at our brand new hotel and everyone was safe. We hope we have the pleasure of seeing you again soon. Travel Safe! "Failed wake up call, RUDE desk manager"
Stayed here because my original flight was canceled and the new flight required a 6 hour layover in St. John's. Set up a wakeup call for 5am, but staff never called me. I called the front desk in the morning after missing my flight and was told that the call request had been properly logged the night before, and staff had no idea why no call was made. Spoke with the desk manager, Mason, and found him to be condescending and rude. He told me I should have set my own alarm (which I did) and his response was only shifting blame for the hotel not performing an important service that it offers. He tried to beligerently backtrack several times and implied that I was not telling the truth about not recieving a call. Eventually I sent him away as he was causing me distress. I feel it important to mention that I don't blame the hotel for my missed flight (as ultimately that is my responsibility) but they should be held responsible for members of their management team acting in an inappropriate way toward a guest. The rest of the hotel experience was satisfactory. My room was clean, the bar had good food and reasonablewait times. All staff I interacted with (excluding Mason the desk manager) were professional and kind during a stressful time. I will never stay here again as there are lots of other options in the St. Johns area. Had a very nice stay at this Best Western. It is very well decorated, and has all the amenities. The breakfasts have hot food and continental. Lots of choices. Even has gluten free breads separately offered with its own toaster. Rooms have very comfortable beds, and vinyl hardwood flooring which is such a great thing and so much cleaner. Staff were great. We had the king suite and loved that option. We would recommend staying here. very nice new hotel, bar and bar staff were great. free breakfast the next morning was very nice. the room was spacious and the bed very comfortable. short trip to the airport which is really convenient. Dear Queenieg, Thank you for the nice comments about our hotel being comfortable and about ours staff being great. Many thanks and safe travels. Dear Reemsaliba, Thank you for taking the time to comment. I appreciate your comments and hope you had a great time in St. John's. Thank you for choosing to stay with us. Safe Travels! Stayed at this new hotel on two consecutive weekends for business. I love the proximity to the airport (with 24 hour shuttle service), overall modern chic appearance, great staff all around, on site restaurant, exercise and pool facilities with fitness centre and whirlpool tub, great rooms. My new go to place for business or leisure trips to St. John's. Dear Cupido D, Thank you so much for taking the time to write such a great review about us for all future travelers to read. We are so excited you enjoyed your stay and time again. 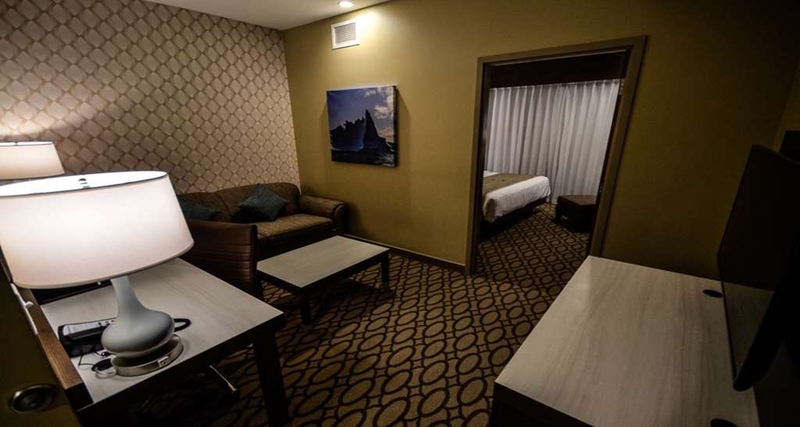 We strive to make you feel at home when you are with us. See you again soon! "Very Clean and Close to Airport - Great Food!!" Stayed here for 2 days in June. Absolutely a beautiful hotel - only been open a couple months. Front staff are very friendly and knowledgeable. 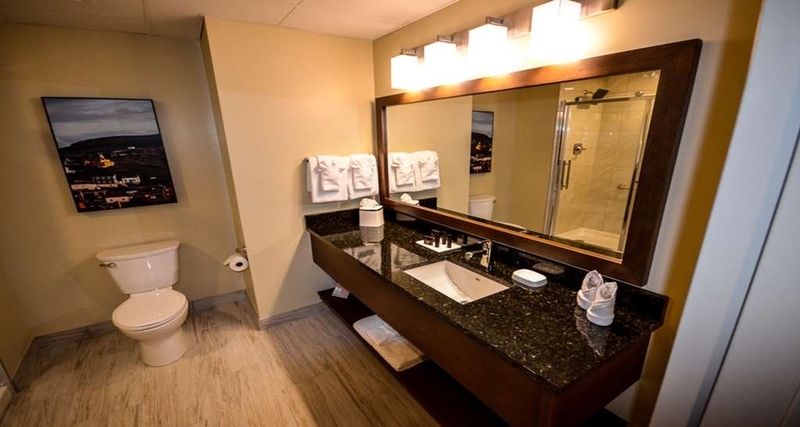 Rooms are well laid out and appointed nicely - bathrooms are one of the nicest I've seen. 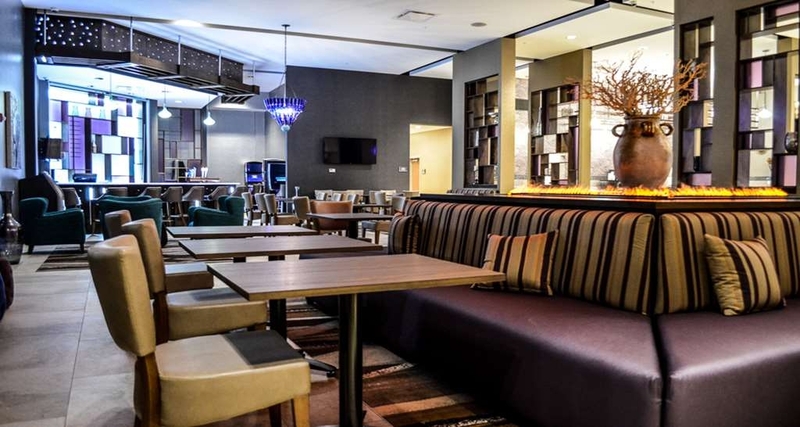 The restaurant and lounge offer a great selection of local and international drinks and food that are awesome. They even have a guitar available for anyone wanting to belt out a tune. I didn't get a chance to try the pool area, however, I did have a look - very clean and laid out nicely with a water slide and hot tub. When i return, I will most definately be staying at the same place. "Stunning Entrance - Fabulous Staff"
This brand new property is brimming with excited staff eager to help you get settled in for a lovely stay. From the cheery greeting, to the beautiful lobby, to the pleasant elevator music to the beautiful spacious king room with a lit fireplace, our stay was superb. There is a lovely bar/restaurant in the lobby we will have to try another time and the water slide looked like it would provide hours of entertainment for those with the energy to enjoy it! A short drive to the city center and less than 5 minutes shuttle to the airport. Triple pane glass windows reduce airport noise. Dear Brenda M, Thank you so much for taking the time to write such a great review about us for all future travelers to read. We are so excited you enjoyed your stay at our brand new hotel. We strive to make you feel at home when you are with us and there is nothing better than blending your family with our Best Western family. See you again soon! Beautiful new hotel has clean modern look. All the staff we met were warm and friendly. Plugs available for electric cars. 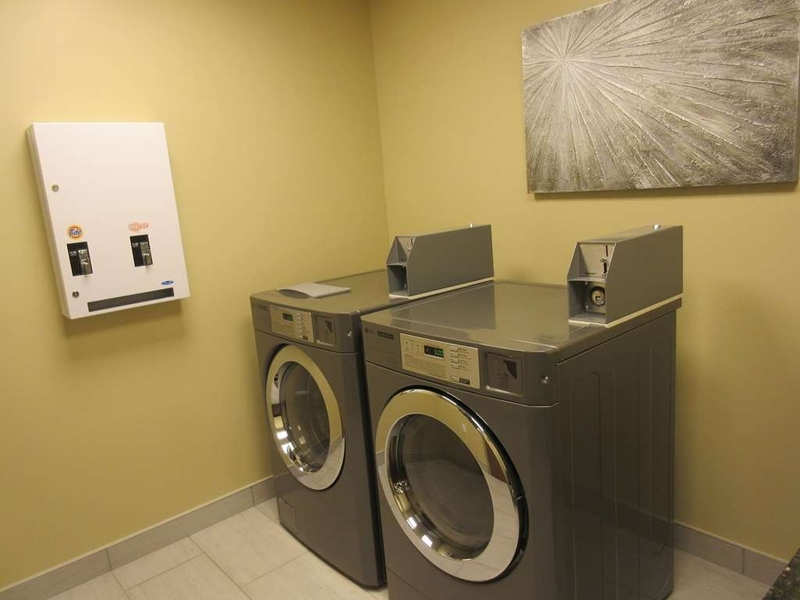 I really appreciate the amenities; laundry rooms, hot tub, and breakfast. The pool even has a waterslide! I would most definitely stay here again! Dear Sandra E, We always enjoy reading our guest reviews, especially when they're as good as this one. Thank you. 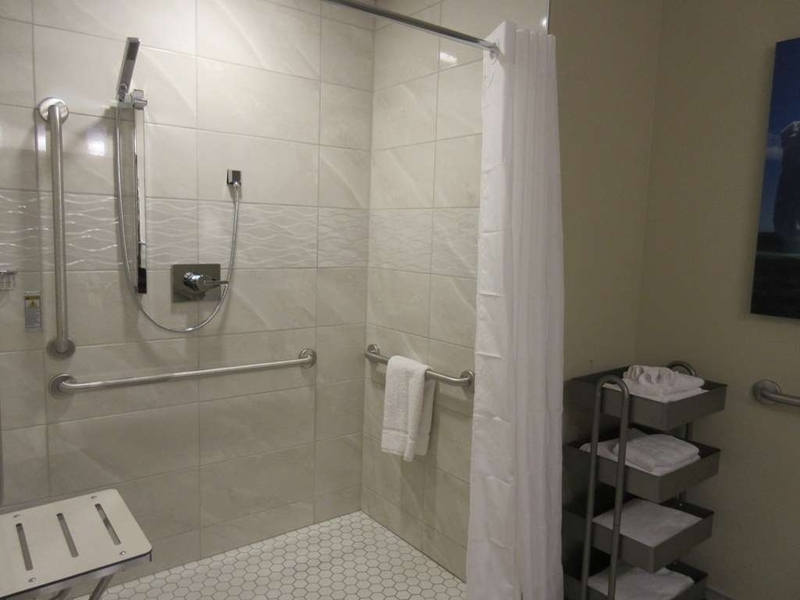 We take pride in our St John's hospitality and we're happy you enjoy our service and on-site amenities. We'll be sure to share your comments with our hotel team. Looking forward to welcoming you back again soon! "Best Best Western so far!" Granted it is easy to give a big score to brand new hotel. But this one deserves it. Newly opened since April 2018, of course all is new and not worn out. But, the design and materials selected will ensure this hotel will remain looking new for a long time. I had a king size bedroom that had a living room sort of alcove. Large bathroom with nice accessories. I am not a fan of rainfall shower heads (not enough pressure) and prefer adjustable massage style shower heads. Staff was awesome and helpful. Big call out the Ashley for great smile and kind greeting at the end of the day Breakfast was the usual fare, but all fresh and in a very nice environment. There is very good looking bar in the lobby but I did not go in. Next to airport, so I had to drive a little ways morning and night, but well worth it. Definitely my new "home" when in St-John's. Dear mrobic, Thanks for staying at the Best Western Plus St John's, and for your sharing your comments with the traveling community. We strive to provide the best experiences for our guests and we're pleased to hear that you had an enjoyable stay in St John's.. We hope we have the pleasure of seeing you again soon. Travel Safe! After a long flight we arrived in St John's to a very warm welcome from Janet in Reception! After settling into a beautiful suite we headed down to the lounge / restaurant for a very tasty snack. The menu has a variety of choices and the food was very good!!! 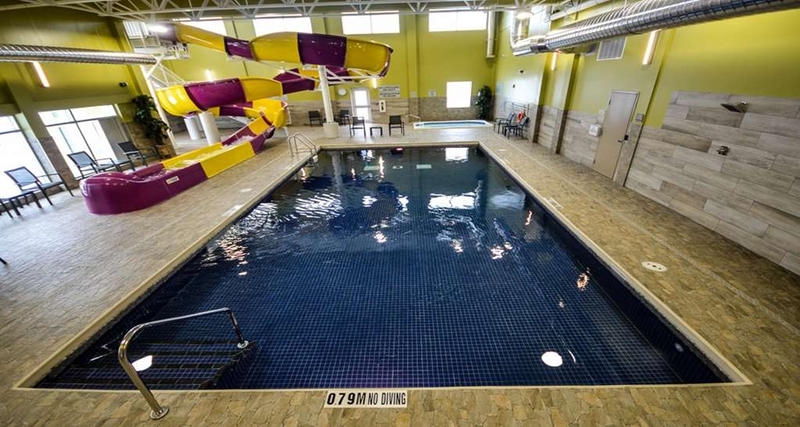 The hotel has a wonderful gym and beautiful leisure area with heated pool, hottub and waterslide. The staff are a true reflection of famed Newfoundland hospitality! Management has done an excellent job in securing and training the very best employees for their hotel! Although I cannot remember everyone's names I would like to thank Lori, Laura, Denailie (sp? ), the 2 Managers and the van drivers whose names unfortunately I did not get for the hospitality shown us! To those whose names I did not get we thank you as well! Excellent hotel and services! Highly recommend! Dear Dolores L, Thanks so much for the review. We're glad you feel our staff treats you like family, because you are! I'll be sure to pass your compliments along to our great staff. I know they'll be as grateful for your kind words as I am! 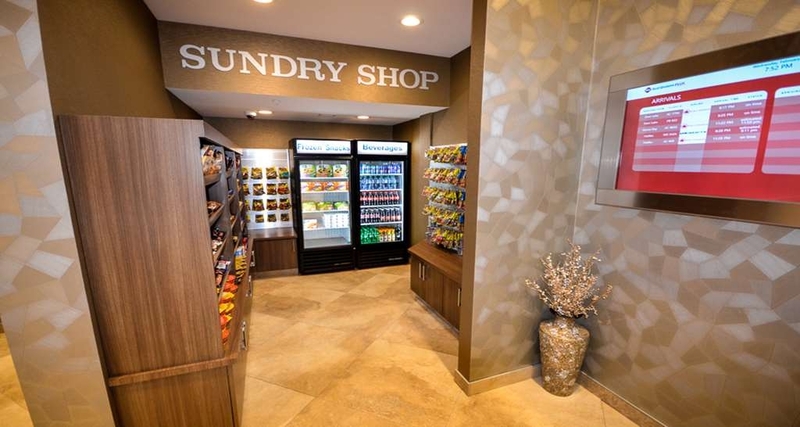 We take pride in our St. John's hospitality and we're happy you enjoy our service and on-site amenities. We hope we have the pleasure of seeing you again soon. Travel Safe ! When checking in I was charged the wrong rate. I accepted the charge as I did not have access to my booking at the time. When I went to my room and accessed my rate I did notice I was over charged $30. I notified the front desk and they indicated that they knew they charged me the wrong amount but wanted me to prove it. They then refunded the difference. During the night the night auditor fraudulently recharged the difference to my credit card hoping that I wouldn't notice. I spoke to the front desk in the morning who said “It wasn't me what do you want me to do?” I would steer away from these kind of business practices. Looks like many are as the hotel was nearly empty and I had to stay here as my normal hotel footsteps away was sold out. Dear Potter477, Thank you so much for the review. I would like to apologize because, from the sounds of things, you were not as quite blown away as we hoped. I'm sorry the taxes percentage was incorrect in one of the website you booked you room. With your feedback we made sure everything was correct from now on. Thank you for bringing each issue to our attention and will work hard to fix these issues so your next stay with us is nothing but extraordinary. We always strive for perfection and do not like to see our guests disappointed in any way. Come visit again! 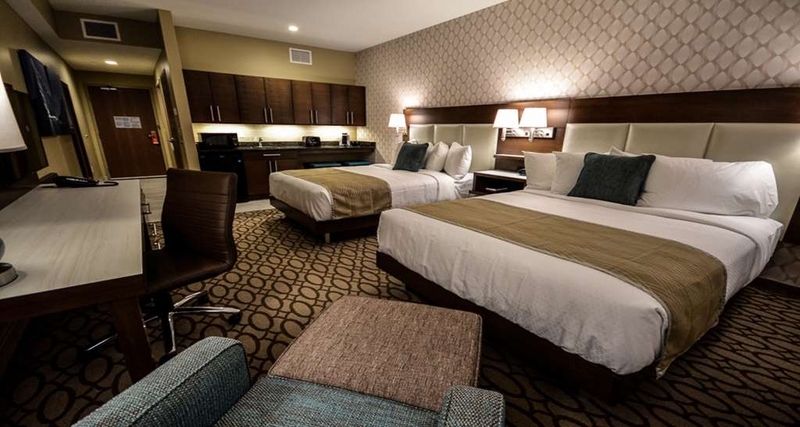 Brand new hotel, clean, and comfortable. Beds are lovely, but the pillows are a dream! The biggest pillows I have ever slept on, felt like I was sleeping on a cloud. However, you would expect this from a new hotel! What makes this hotel even better than others is the wonderful staff! I have never met such kind, friendly, and accommodating people, from Emily and Tig at the front desk, Nichol in the restaurant, and Evan in maintenance. The breakfast lady whom I did not get her name is also wonderful, polite, professional, and efficient. Yes, it is a new hotel and they are still working out some kinks but we thoroughly enjoyed our visit to Newfoundland and these individuals will be in our memories forever! Thank you all! Dear sooline2, Thank you for taking the time to comment. I am happy to hear you enjoyed your stay with us!We're glad you feel our staff treats you like family, because you are! We strive to make your stay as enjoyable as possible and am glad we did. We look forward to having you stay with us again real soon. Travel Safe! Hotel was clean and bright and the staff were great. Rooms were new and comfortable. The hotel had a lounge onsite and the food was good and the servers were friendly. My check-out was at 430 am and they had breakfast to-go for me all ready at the desk. Great stay! Dear graytan72, We always enjoy reading our guest reviews, especially when they're as good as this one. Thank you. We take pride in our St. John's hospitality. We'll be sure to share your comments with our hotel team. Looking forward to welcoming you back again soon. Travel Safe! "Best hotel in St John's"
Stayed here one night. Booked through Expedia and got a good rate. Check in was quick. Janet was friendly and let us check in early. Room was clean, spacious and comfortable. Beds were very comfortable. My daughter enjoyed the pool/slide. Breakfast was plentiful and ladies working there were so friendly. Housekeeping staff were very friendly as well. Check out was quick and I'd like to bring mention to the gentleman at check out who served us May 27 am. A very friendly employee who was a pleasure to deal with. We will be back?? Dear Lpeddle, We always enjoy reading our guest reviews, especially when they're as good as this one. Thank you. 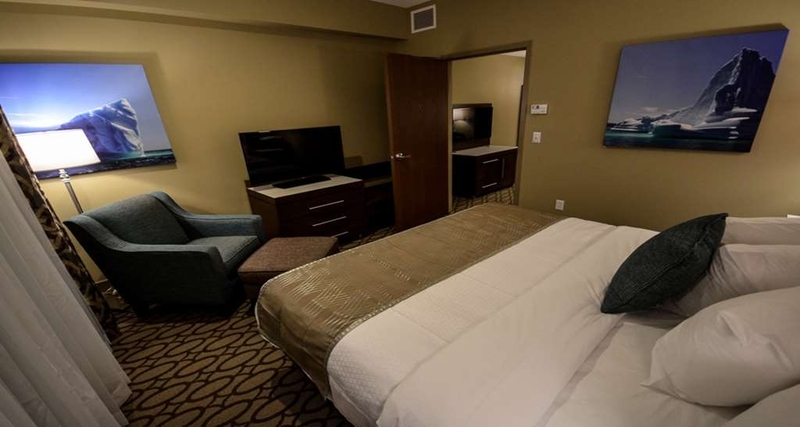 We take pride in our St. John's hospitality and we're happy you enjoy our service and on-site amenities. We'll be sure to share your comments with our hotel team. Looking forward to welcoming you back again soon. Travel Safe! We were so pleased withg everything at this hotel! It has to be by far the best hotel in all of St. John's hands down! From the staff, the cleanliness, the offerings, to the food, it was absolutely wonderful and they have made a permanent customer out of us! I was so happy to see a Best Western in Newfoundland. This hotel does not disappoint. The staff are extremely friendly. The service is exceptional. The rooms are fantastic. Close to airport and everything else. Dear Chris M, Thank you so much for taking the time to leave such a positive review about our brand new property and our amazing staffs. 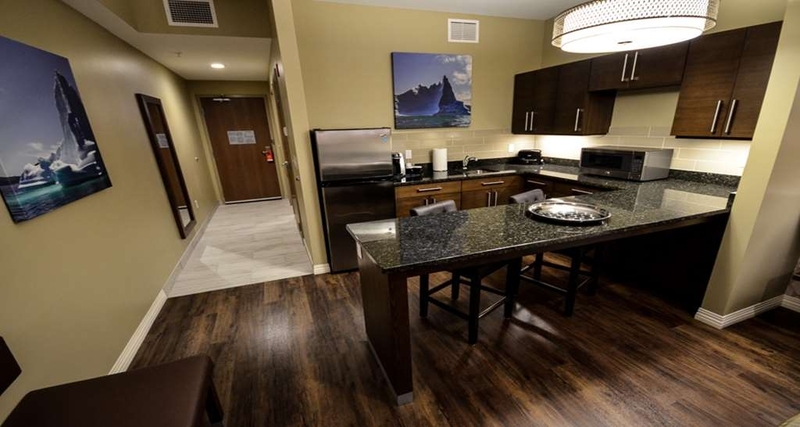 We are so glad to hear that our prime location offered convenience and flexibility during your stay with us. Also, thank you for being a loyal guest to the Best Western family! Hope to see you soon and travel safe! Awesome staff in an hotel with nice amenties. Breakfast included in price was pretty good - could have had a few more options - pancakes , more than plain omelettes (cheese, vegetables, weren't options). Dear d0nbaker611, I'll be sure to pass your compliments along to our great staff. I know they'll be as grateful for your kind words as I am! We work on our breakfast offerings on a regular basis, and I will be sure to keep your suggestion in mind. Thank You. So the hotel is about 7 weeks old, so you expect it to be nice. Having stayed at over 100 BW hotels across Canada, I was surprised to find that all the "Bugs" or idiosyncrasies seemed to be worked out. BUT what made this hotel great was the team. the level of service was great and the attitudes were awesome! The hotel seems to be a 15 min car ride from everything you might want to see. Dear larrymD7473BQ, Thanks so much for the review. We're glad you feel our staff treats you like family, because you are ! Thank you to be a loyal member of the Best Western Family! We appreciate that you continue to choose us when you come to St. John's, and we look forward to seeing you next time. Dear susankY7457XQ, I'll be sure to pass your compliments along to our great staff. I know they'll be as grateful for your kind words as I am! We work on our breakfast and Grab N Go bags offerings on a regular basis, and I will be sure to keep your suggestion in mind. Thank you and hope to see you again soon! "Newly opened, need to work out some of the bugs." The hotel is modern and clean. Great location for travellers. The beds although they are saying they are queen seemed a little small than our usual bed. The rooms are spacey and well laid out. The staff are super eager to please and were friendly and polite. It was grand opening night when we arrived and the TV system wasn't working, which was a bit of a let down as we wanted to go to our room and relax and unwind. TV is a big part of that :(. Otherwise, the hotel is lovely. Dear Shoppingmamma70, Thank you for the nice comments about our hotel being clean and modern. We also appreciate the nice comments about our associates being helpful and friendly. Hope to see you again soon! 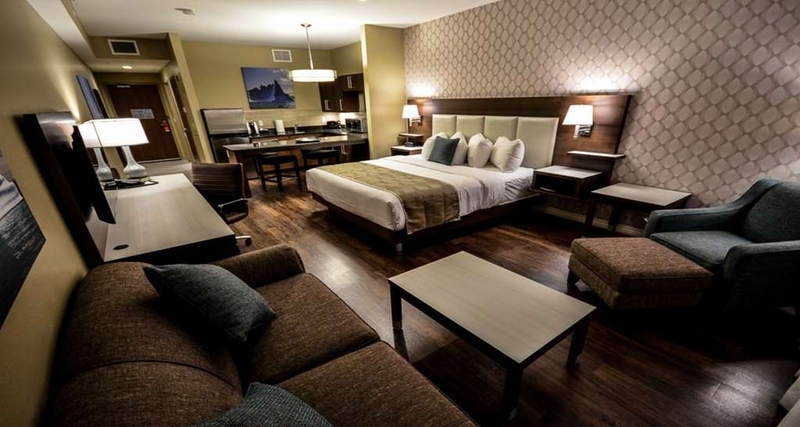 "Best Western, St. John's, NL"
This newly opened hotel in St. John's is fabulous. The color scheme and attention to detail is amazing. The lobby is fantastic and the rooms/beds are so comfortable. 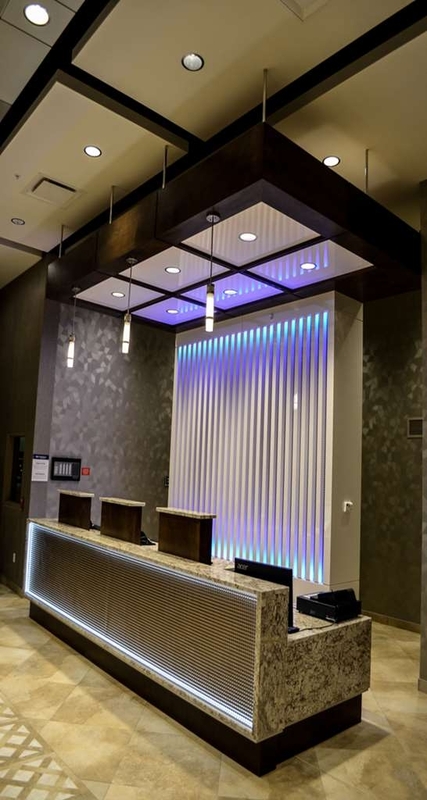 The front desk staff are some of the best we have encountered, so friendly, helpful and courteous. Lots of Breakfast options to choose from and we would stay here again. Dear DML412, Thank you for taking the time to comment. I am happy to hear you enjoyed your stay with us! We strive to make your stay as enjoyable as possible and am glad we did. We look forward to having you stay with us again real soon. Travel Safe. 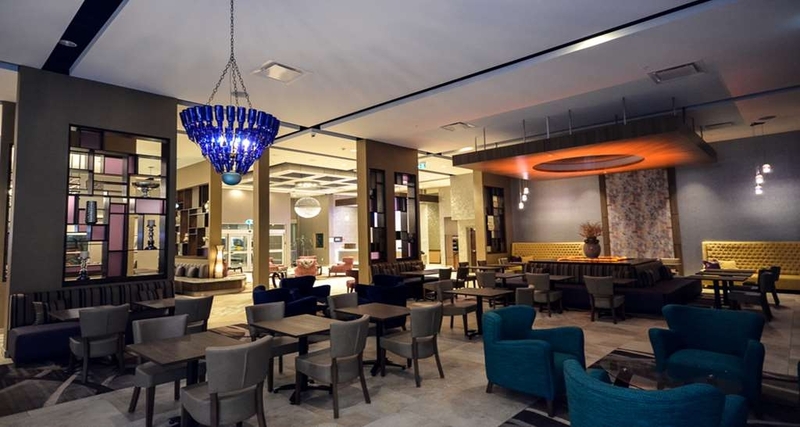 "Best Western Plus St.John's Airport Hotel&Suites"
Dear carolle69, Thank you so much for taking the time to write such a great review about us for all future travelers to read. We are so excited you enjoyed your stay at the brand new state of the art Best Western PLUS. It was a pleasure having you and we are very happy to hear your stay with us was “5 stars and Fabulous in every way” We strive to make you feel at home when you are with us and there is nothing better than blending your family with our Best Western family and the great culture of Newfoundland. See you again soon! Gorgeous hotel with clean modern rooms, close by from the airport with shuttle services, which is very convenient!! Got here feeling at home, thanks to the staff who welcomed me with a smile and an amazing service. The kids loved the waterslide at the pool area. Pool and hot tub was nice and clean. Will be back again for sure!! Dear sk8gr82018, Thank you for taking the time to comment. I am happy to hear you enjoyed your stay with us! We strive to make your stay as enjoyable for you and your family as possible and am glad we did. We look forward to having you stay with us again real soon. Travel Safe! Brand new hotel..... wow . Greeted with great friendly yet professional service. Stunning decor , 5 star public areas . Exercise area with hot tub & pool so relaxing. Everything in room so convient & modern. Dear Patricia Oldford, We always enjoy reading our guest reviews, especially when they're as good as this one. Thank you. 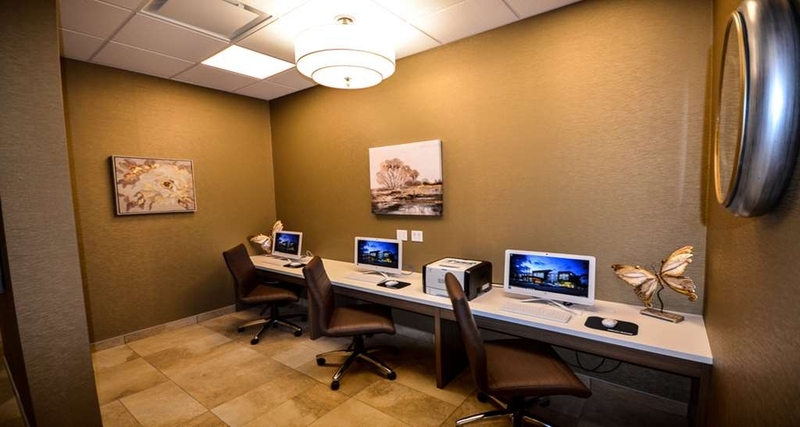 We take pride in our St.John's hospitality and we're happy you enjoy our professional service and on-site amenities. We'll be sure to share your comments with our hotel team. Looking forward to welcoming you back again soon. Travel Safe! We got to stay at this beautiful hotel for the first time and it was top notch! It has everything you could ever imagine! Our teenagers even enjoyed their huge water slide while we were having a drink in their beautifully designed lounge. They have a restaurant on site and a really nice fitness center. We will be back for sure! Dear volley92, I'll be sure to pass your compliments along to our great staff. I know they'll be as grateful as I am to hear from you that our hotel is top notch! Thank you very much from all of us at the brand new Best Western Plus St.John's Airport Hotel & Suites. Can't wait to welcome your family again! I had the opportunity to be one of the first guests at the new Best Western Plus Airport Hotel. They picked me up at the airport with free shuttle service. This Hotel Is simply amazing, Everything you need:a restaurant, a bar, VLT machines. and a Hot breakfast buffet in the morning. Our grandkids enjoyed the huge waterslide while we were enjoying the hot tub. The staff are amazing. This hotel is very well priced. If you decide to walk from the airport, it's a less than 10 minute walk. With the beautiful decor, you'd think you're in Las Vegas. My hats up to management and team! Staff and hotel are just amazing. Located minutes from airport, easy access to shuttle service. Water slide one of a kind. Quiet rooms and very clean. Already re-booked for next months trip, Looking forward ! Dear Kevin M, Thank you for taking the time to comment. I appreciate your comments and hope you had a great stay with us at the brand new Best Western Plus.Thank you for choosing to stay with us and will see you next month. Travel Safe! I travel regularly and this hotel is by far the best one yet. State of the art amenities. 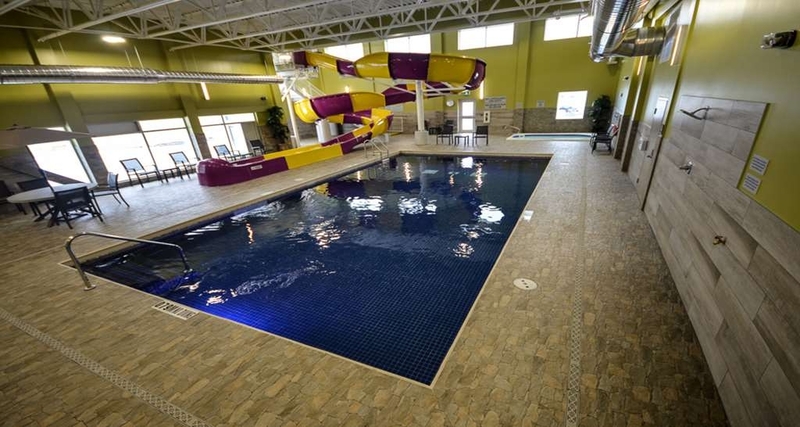 The pool has a huge 100+ feet slide (bring your swim suit totally worth it!) Amazing lounge and bar area. The rooms are really impressive and to top it off, the staff is really friendly and some are even bilingual. I totally recommend this new hotel. Dear Emmanuel T, Thank you for taking the time to comment. I am happy to hear you enjoyed your stay with us! We strive to make your stay as enjoyable as possible and am glad we did. Your support and feedback inspires our staff to provide every guest with the best customer service every day and we're happy you enjoy our service and on-site amenities. See you again soon!